Food connoisseurs and chefs alike are well aware of all of the number of differences between similar fruits and vegetables. But a lot of folks are rather brainwashed, indoctrinated you could even say, by big corporations and fast food chain diets. These folks may rely on a diet that consists of soft drinks, fast food, take-out, microwaveable dinners and Ramen noodles. While there is nothing morally wrong with this lifestyle choice, other than obvious health issues, it is a shame in many ways that a lot of folks may not know the delicacies and deliciousness of every fruit and vegetable mother nature has provided us. These particular people may not even be aware of the existence of fruits beyond the common culprits, such as your apples, oranges, and bananas. Apricots and peaches are a commonly mistaken pair of fruits, so I thought I’d share with you some of the differences between these two delicious treats. Peaches grow from a tree native to Northwest China. These trees are primarily located between the northern slopes Kunlun Shan mountains and the region of Tarim Basin. Not surprisingly, China is the world’s largest distributor of peaches. Peaches are a delicious, juicy fruit that belong to the genus Prunus which also includes cherries and plums. The peach also falls into the subgenus Amygdalus, also home for almonds. The species name persica is a reference to its widespread cultivation in Persia, from which it was later transplanted to Europe. Peaches are also commonly mistaken with nectarines, and despite the fact they are both from the same species, they are oftentimes regarded as separate fruit commercially. The main difference between the two is the presence of fuzz on the skin of peaches, one of its defining traits. Nectarines, on the other hand, are a fuzz free fruit, characterized by an absence of fruit skin trichomes. Peaches grow best in higher altitudes, as the trees have a chilling requirement that prevents them from growing in low altitude tropical areas. Surprisingly, the tree can resist temperatures as low as -22 Fahrenheit. The trees have a lifespan of roughly 12 years. 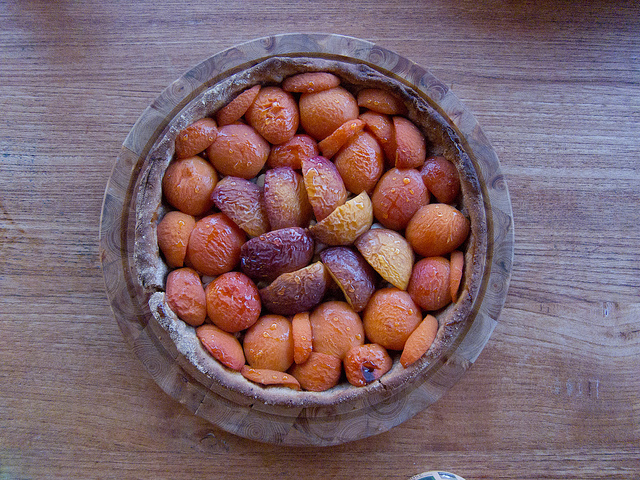 The apricot is primarily native to a continental climate region, and thrives in regions that experience cold winters. Despite this the apricot can also prevail whilst growing in Mediterranean climates, given enough cool winter weather provides proper dormancy. Dryer clients prove good for the maturation of the fruit. Although apricots are similar to peaches, hence the necessity of this article in the first place, they are more hardy fruits when faced with cold climates. It can tolerate temperatures as low as -22 Fahrenheit, and even lower if the fruit is healthy. So what exactly are the main differences between the apricot and the peach? Well for one thing, the apricot is smaller than the peach, and is generally much sweeter. Don’t get me wrong, both are delicious in their own ways, but if you’re looking to satiate that sweet tooth an apricot should be the more obvious choice. Another big difference is the skin – the peach has a very velvety skin, filled with fuzz which is one of it’s distinguishing factors. The apricot, on the other hand, has smooth skin, usually devoid of fuzz entirely. A particularly major difference is the toxicity of the seed and stone of the fruits. The seed of an apricot is widely revered for it’s medicinal purposes. The stone of a peach, on the other hand, is classified as venomous and to be avoided. So while the peach and apricot are both derived from the same prunus family, it is quite obvious after weighing all of these various differences that they are not, in fact, the same and are quite far removed, incidentally. Now that you know about all the differences between these two delicious fruits, why not enjoy them both on their own merits, and stop confusing the two?! Happy cooking and happy eating! de. "The Difference Between Apricots and Peaches." DifferenceBetween.net. August 20, 2014 < http://www.differencebetween.net/object/comparisons-of-food-items/the-difference-between-apricots-and-peaches/ >. Did you mean poisonous rather than venomous in regard to the peach pit?